In making studies of clouds I am constantly surprised and awed by what I see. Nature truly is the most influential of all the artists, full of shocking and inspiring colors and compositions. I have learned so much about color just watching the sky change over the course of an hour. As a muralist I often look at the work of the master artists who came before me, for technical advice as well as inspiration. Some are known for their wonderful figurative murals or portraits, others for brilliant trompe l’oeil. To whom do you look for the best clouds? 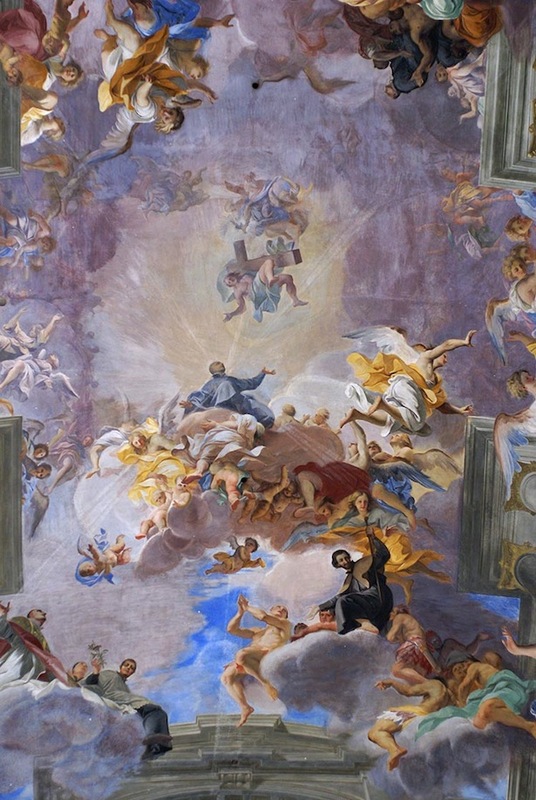 Artists like Andrea Pozzo and Daniel Gran both are so famous for their illusionistic painting, that maybe they don’t get enough credit for composing really beautiful clouds: clouds that break out of the “sky” and jump into the room; clouds that are carrying groups of figures and yet still managing to fly up, create depth, and add color to dramatically designed scenes. 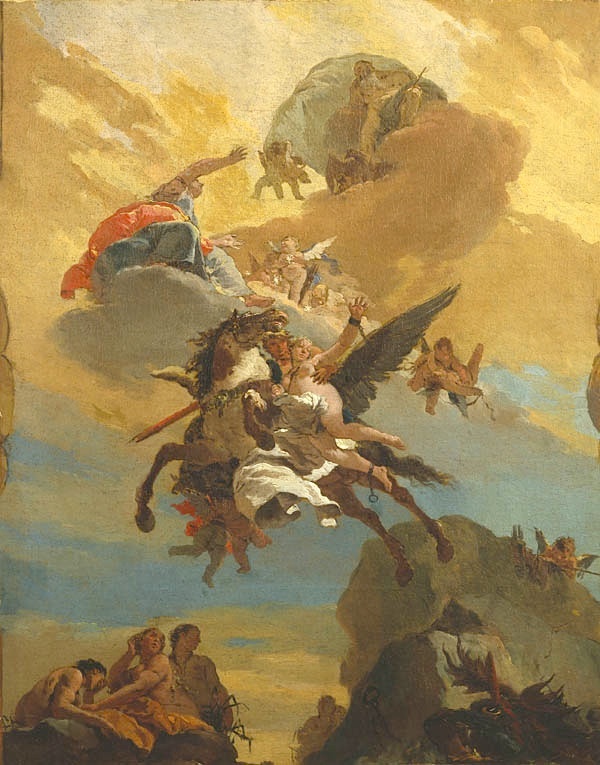 To my mind no one paints cloudscapes better than Giambattista Tiepolo. 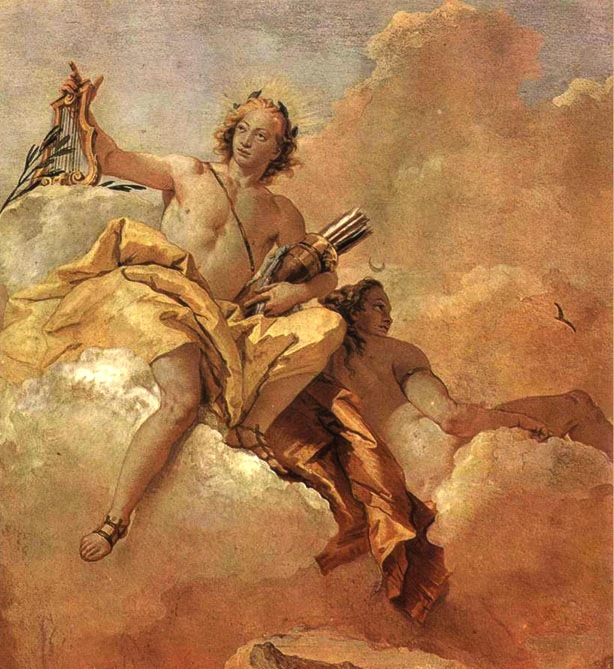 The virtuosic star of 18th century Venetian art, he painted larger-than-life goddesses and substantial allegorical figures seated in clouds that look as comfortable as down-filled cushions and light as a single feather. 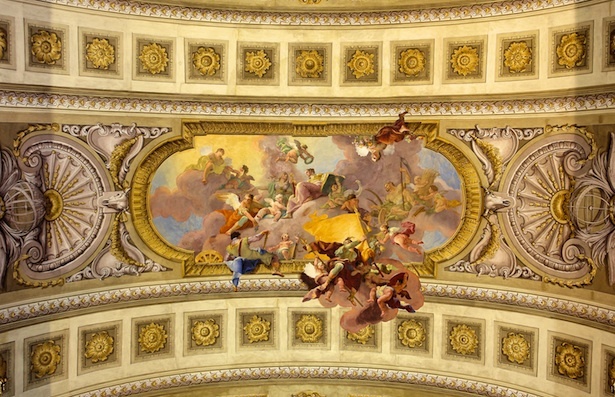 Tiepolo's murals are filled with light, and the most beautiful color palettes imaginable. 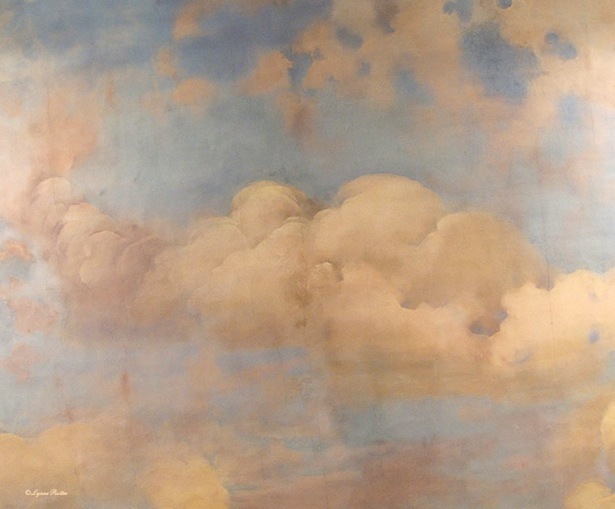 Join me here on a tour of some of my favorite clouds murals. 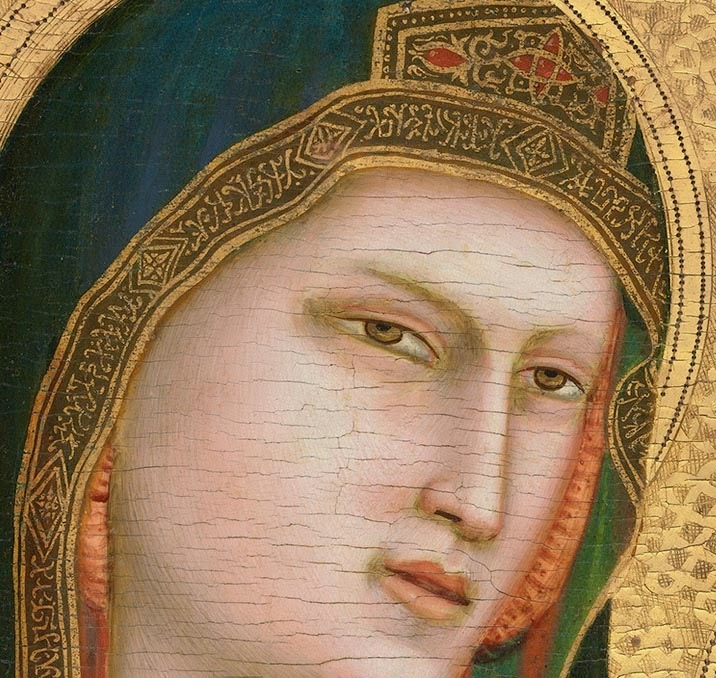 The center of the ceiling in the spectacularly painted Camera degli Sposi is one of the earliest examples of the di sotto in sù effect. 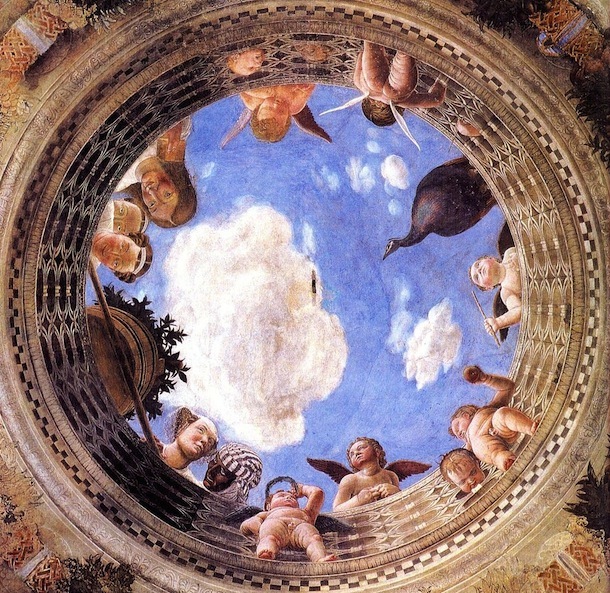 While the cloudscape in this ceiling is extremely simple, it’s effective because the scale of the clouds is consistent with what one could possibly view through an oculus of this size. The oldest surviving fully enclosed theater in the world, the Teatro Olimpico has the feeling of an open amphitheater in ancient Rome, thanks to this spectacular painted cloud mural over the cavea (seating area). This theater was designed by the great Renaissance architect Palladio and seeing it was one of the top ten experiences of my artistic life. When I took this picture I could barely operate the camera as my eyes were filled with tears. More about the overall decoration than about reality, the colors of Daniel Gran‘s clouds play right into the décor of the rest of the interior, taking the room into its composition and the viewer along with it. The Prunksaal (Austrian National Library) in Vienna is one of those amazing over-the-top Baroque libraries. Martin Johann Schmidt‘s colorful cloudscape whirls around the figures and spirals upward, enhancing the foreshortening of the figures and creating a soaring effect. I love how the angel is holding up the lantern, drawing the room into the mural, and visa-versa! How do you support larger than life figures and still manage to make the clouds airy and filled with light? Watch and learn as Tiepolo does this with ease. 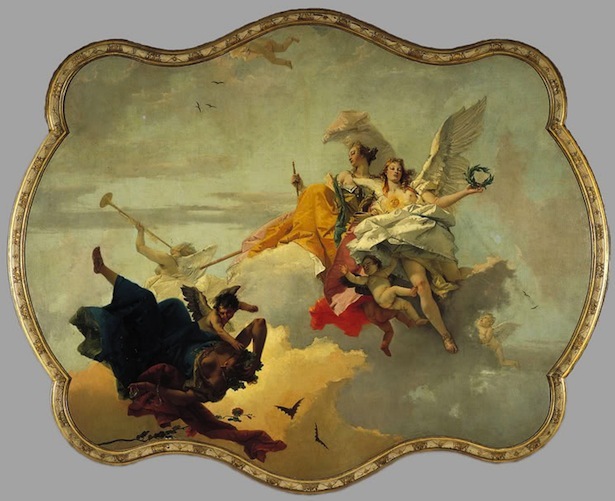 Multiple levels of clouds and strong contrast in Tiepolo’s Manin ceiling mural create depth and support the action in this allegorical tale in which sorority sisters Virtue and Nobility send out their posse of cherubs to put Ignorance in her place once and for all. Behind the hair-pulling drama, a bright yellow cloud juxtaposed over a deep purple one: ka-pow! 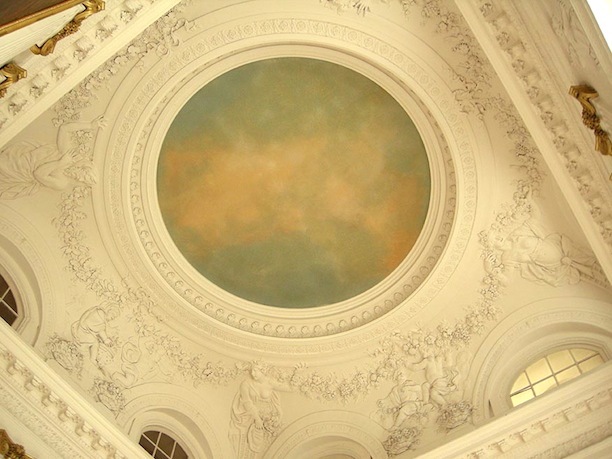 This simple cloud mural creates a sense of elegant calm as you ascend the ornate white plaster staircase of the beautiful Rococo wing of the Charlottenburg Palace. Real clouds do the most amazing and beautiful things. My best compositional references come from nature. Flickr and google images have thousands of unbelievable pictures of amazing clouds. Do you take cloud pictures too? 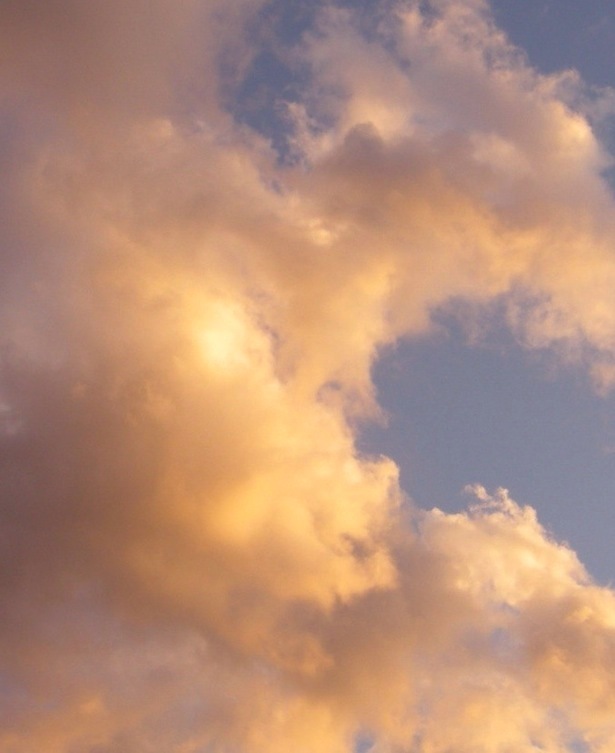 If so, consider joining the flickr pool “Painterly Clouds” and add your inspiring shots. 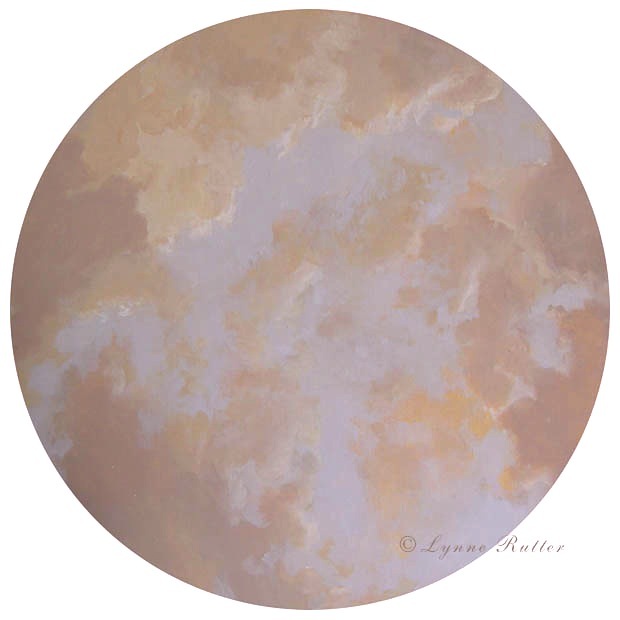 Nature inspired the composition of this dome cloud mural but I looked to maestro Tiepolo to inspire the painting technique, and for “permission” to make the sky purple and orange. Was carried away by your beautiful post ! Thank you ! Wow, the Allegory of War and Law Fresco is exquisite worth the trip alone just to see this icredible artwork. Lynne there is Something so ethereal & magical about clouds. When incorporated into works of art...a dream! I especially like how Daniel Gran's allegorical figures overlap onto the architectural detail. That really cinches the impression of their being suspended in air! Amazing works of arts. Thanks for posting them. Your collection of pictures is excellent. I traveled similar routes year after year and continue to be inspired with such masterpieces in my own work and in my daily life. May we continue to seek and offer our customers elegance and grace. Oh, Yes, Yes YES!!! The clouds are endlessly fascinating..... and inspiring! Your examples are gorgeous! 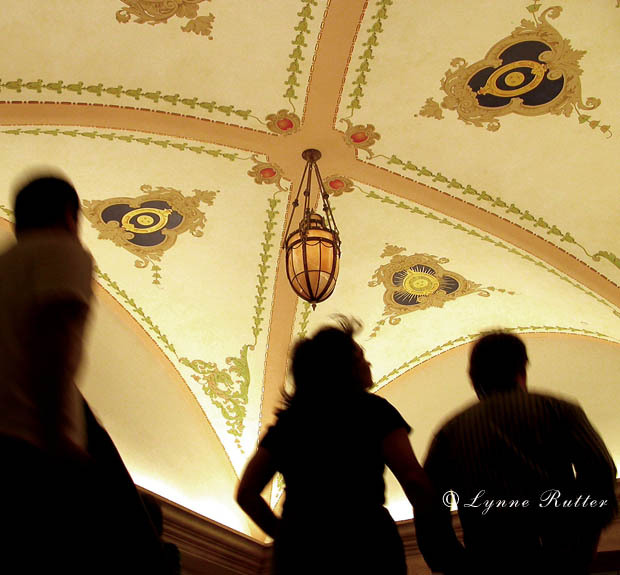 I also believe in painting ceilings with sky and clouds! Most of my versions are very small.... in my dollhouses..... but I have painted my Real life ceilings too. 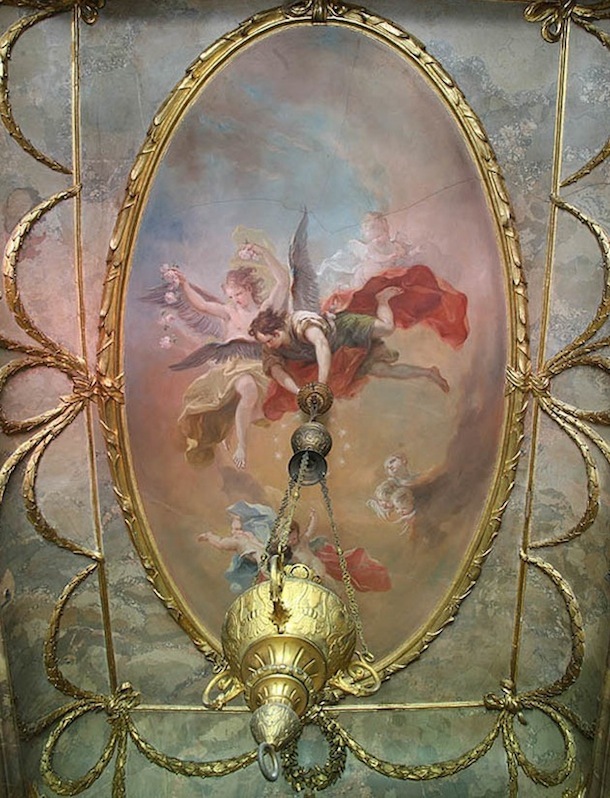 It is incredibly difficult to paint ceilings! But I always just want to have that amazing sky overhead! Thank you for sharing your incredible images!